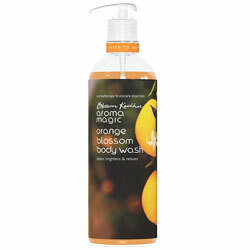 Aroma Magic Orange Blossom Body Wash - Cleans, brightens & relaxes - Natural Body Cleanser - Cell Regrowth & Prevent Ageing. Help in cell regrowth and prevent ageing. Natural body cleanser formulated out of plant extracts, vitamins and anti-oxidants. Orange Blossom extracts condition, soothe and deeply nourish the skin. They also help in cell regrowth and prevent ageing. Its anti-inflammatory and anti-oxidant properties heal the blemishes on your skin. Pure blend of lavender, neroli and petitgrain essential oils treats acne and relaxes your body tissues after a bath. Leave you soft, gorgeous and in a mood to celebrate. Fresh, fruity aroma refreshes, elevates the mood in an instant and keeps your skin glowing. Aqua, Apple cider vinegar, Cocos Nucifera, Lavendula Angustifolia essential oil, Organic vegetable gum, Citrus Aurantium essential oil, Citrus Aurantium Amara essential oil, Orange blossom extract, Tocopherol- Rich extract vit-E, Optiphen, Colour (food grade).